The countdown is on! Craft brewers and craft brew enthusiasts from BC and beyond will soon be gathering in Penticton to celebrate at the 24th annual Okanagan Fest of Ale Craft Beer Festival. 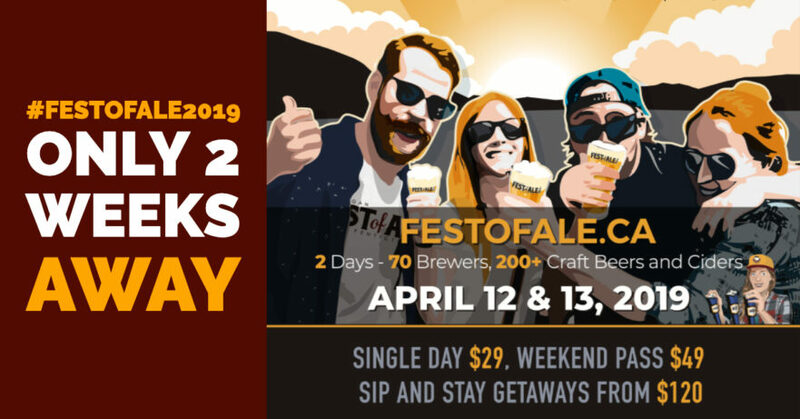 A favourite for patrons and participants alike for over 20 years, this must attend beer festival takes place at the Penticton Trade & Convention Centre April 12th and 13th in Penticton. 75 exceptional BC based craft breweries and cideries will be on hand with 200+ craft beers and ciders for tasting. Of the participating breweries, 19 are new to the event and 8 will be featuring craft cider. The list of participants is incredible and includes breweries who have been attending since the very first festival, and some highly anticipated new breweries attending for the first time. The lineup of beers and ciders being offered is outstanding with a great mix of core favourites, new releases, collaborations, cask ales and experimental brews to try. You can find the listings on the Fest of Ale website and under Okanagan Fest of Ale on the Untappd App. With over 200 craft beverages for sampling, there is definitely something for everyone at Fest of Ale 2019. For local craft beer enthusiasts and out of town guests extending their Okanagan craft beer getaway, a number of craft themed events are taking place around town. With just over 2 weeks to go until the kegs roll in and the casks are tapped, organizers report ticket sales have topped their expectations and encourage anyone wishing to attend the event to purchase their tickets soon! Ticket and accommodation packages will be offered until April 1st with a number of partners already reporting a sellout. Ticket and tour packages are available for guests travelling from Kelowna with space subject to availability, as shuttle seats are filling up fast! Don’t be disappointed and pick yours up in today!